One of its most ambitious plans for vertical growth, transit-oriented development was approved by Delhi Development Authority on Monday. The policy incentivizes people living around Delhi Metro corridors for clubbing their lands and creating mixed-use, high-rise development pockets. Lakhs of Delhi's residents are expected to benefit and property rates along the Metro, already going at a premium, are expected to shoot. 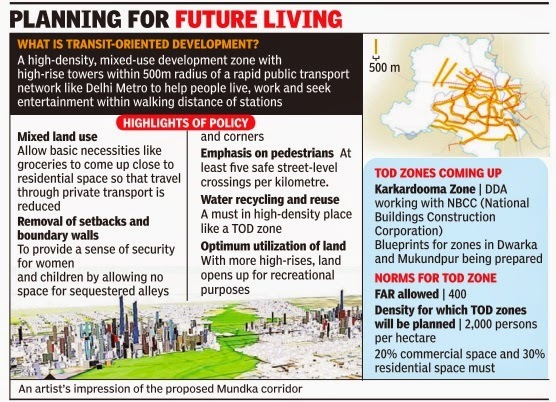 A TOD zone, which extends 500m on either side of an identified Delhi Metro corridor, allows landowners in the area to avail 400 FAR on redeveloping their land. With a minimum plot size of one hectare, a land-owner can come forward and submit his redevelopment plan, provided it meets certain criteria--20% of the space has to be reserved for roads and 20% for developing green spaces; the total built area must be 40%. The focus of development will be on encouraging pedestrian movement. “The high-rises that will come up in a TOD zone will have one-room service apartments and spaces for buying daily groceries and essential items--everything within one building so that a person would have to leave it only for going to work,“ said a senior DDA official. The Authority official said that this policy could come in handy for expansion of group housing societies. “ A group housing society near a Metro station could ideally sell a part of its FAR and raise enough money to expand vertically , as could a group of property owners. The impact on individual owners and plan ning of Delhi overall is hard to overstate,“ the official said. A TOD zone will come up on the lines of a western city , where setbacks and boundary walls around buildings won't be allowed. By disallowing boundary walls, planners hope to improve ground visibility and avoid segregated alleys and corners considered unsafe for women. Water will be recycled and, because of the high-density of people living on less land, areas around will be set free for purposes of recreation or creation of more colleges and hospitals. “We are in the process of setting the trend for future development in the city . We're basically trying to incentivize intensive development in the city and promote vertical growth, taking town planning from traditional to modern models,“ Balvinder Kumar, vice-chairperson, Delhi Development Authority , said.